Our latest eBook release from Distributed Proofreaders and Project Gutenberg is another novel by prolific British romance author Charles Garvice. 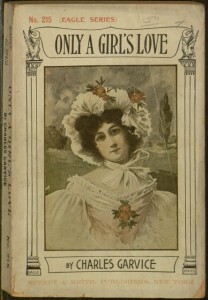 Only a Girl’s Love, like many of the author’s works, tells the tale of a romance across class lines. In this case, the story involves Stella Etheridge, a young woman who escapes an oppressive Italian boarding school to live with her painter uncle in the English countryside, and there falls in love with a typical Garvice hero: Leycester Wyndward, an impulsive and brooding heir to a significant title and fortune. Predictably enough, the couple faces escalating obstacles and a tragedy or two before the inevitable happy ending. This is probably less thrilling to the modern reader than it was to its contemporary audience — even in comparison to some of Garvice’s more colorful works like The Spider and the Fly — but it’s yet another example from the portfolio of a best-selling turn-of-the-twentieth-century author. As always, the entire book can be read online or downloaded through Project Gutenberg.